The ABI is an easy, noninvasive exam for peripheral arterial disease (PAD) screening. This exam is recommended by the American Diabetes Association, the American Heart Association, the American College of Cardiology and the American College of Physicians as a basic screening examination for PAD. Meets reimbursement requirements for CPT 93922. 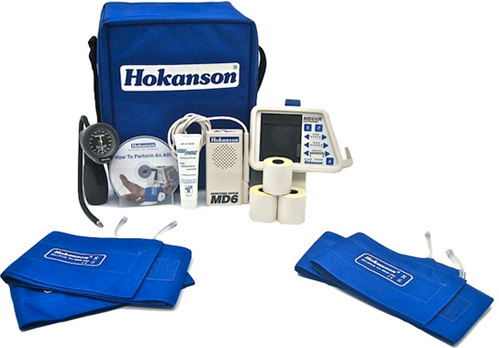 For the Primary Care Provider or Home Health or Clinic, the Portable ABI Kit has everything you need to perform accurate ABI’s to identify patients with PAD who need further attention. Results are documented in real-time via the waveform printed on the strip chart recorder. The green colored LED’s flash provides the clinician a means to identify the “sweet spot” where the maximum arterial flow is located. This Kit provides all the instruments and accessories needed in a convenient carrying case including a chart recorder for documentation. It is ideal for clinics doing ABI screening, home health, physician’s offices and hospitals that want to perform screening at the bedside and other places where portability is needed. The MD6 Doppler (a continuous wave vascular Doppler) for detecting peripheral bloodflow in the ankle and/or arm. The MD6VR Chart Recorder in order to print real-time Doppler waveforms from the MD6 Doppler. Four straight segmental blood pressure cuffs for measurements in each arm and ankle. DS400 Aneroid Sphygmomanometer used to inflate and deflate the vascular blood pressure cuffs. MD6 Carrying Case for easy storage and transport of the Portable ABI Kit. Chart paper is available for both the MD6VR Chart Recorder and the MD35 Chart Recorder. The DS400 is a reliable, sturdy handheld sphygmomanometer that has a 10 year warranty on the calibration.